I recently traveled to Lake Charles, Louisiana for Mardi Gras. Having never been to Southwest Louisiana, I wasn’t quite sure what type of lodging I would find. Visions of bed and breakfasts and mom and pop hotels filled my mind, however, what I discovered was so much more. 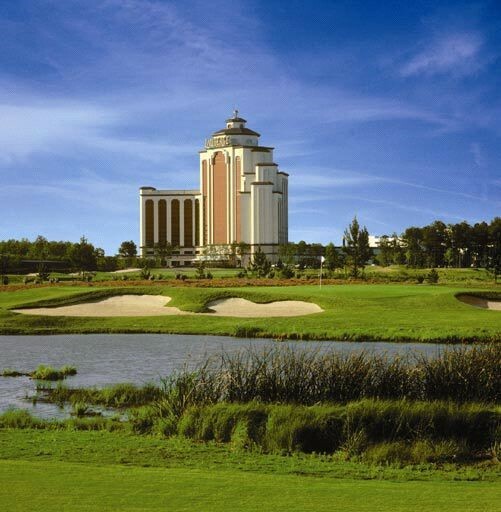 To my delight, I spent four luxurious nights at the L’Auberge du Lac Casino Resort. A visit to L’Auberge du Lac is a journey for the senses. Located half way between Houston and New Orleans, this hidden treasure is nestled on 242 acres overlooking Contraband Bayou. Warm woods and natural stone set the mood of this Texas hill country themed resort. At 26 stories with nearly 1000 guest rooms, the resort includes an 18 hole golf course designed by Tom Fazio, a full service spa, two heated swimming pools with a lazy river, eight restaurants, a promenade featuring unique gift shops and a state-of-the-art casino. This 30,000 square foot casino features 1,600 slots and more than 60 table games, including blackjack, craps and baccarat. There’s plenty to entertain you at L’Auberge, even if you don’t like to play the tables. The resort offers a venue where popular entertainers such as Gretchen Wilson, Willie Nelson, Wayne Newton, Bill Cosby, Jay Leno, Merle Haggard, Lionel Richie and Kenny Rogers have performed. When the celebrities are not in town, local bands are showcased at Jack Daniel’s Bar & Grill, the Stage Bar inside the casino and parties by the pool in the summertime. Above the buzz of the casino, life changes dramatically. The hotel is 26 floors of tranquility. Primary colors take a back seat while neutrals dominate the color palate in the guest rooms. The rooms are decorated with contemporary, yet relaxed furnishings including luxurious must-haves like over sized bathrooms, terrycloth robes, upscale bath amenities and plush bed linens. 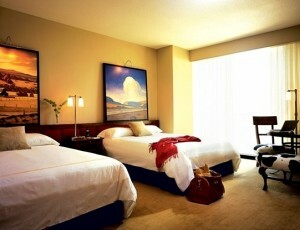 Each room has Wi-Fi capabilities, high-speed internet access and in-room safes. Try as you may not to call it elegant, because that’s not supposed to happen in Southwest Louisiana, L’Auberge exudes it. For spa lovers like me, Spa du Lac is pure bliss for the body and soul. Being bored is not an option at this spa. There is a myriad of activities and options to please every guest. Spa du Lac offers a full range of high-tech cardiovascular and strength machines, along with free-weight equipment. Spa du Lac also houses a salon with a full complement of hair, nail and makeup services, including state-of-the-art manicure and pedicure stations. For the ultimate in relaxation and privacy, the spa features separate men’s and women’s lounges, saunas and steam rooms. Robes, slippers and lockers are provided to all guests. Spa du Lac has an exotic array of skin care specialties and body treatments second to none. The most alluring is a treatment called “Wear Your Cake and Eat It Too!” This 80-minute taste of Heaven consists of a warm organic mixture of carrots, cinnamon and vanilla being massaged into the skin followed by a drizzle of warm honey for added hydration leaving the skin soft, supple and radiant. I have been told that many guests will ask for seconds. This must have been the case during my visit because when I tried to schedule the treatment, all the time slots were already booked. After a hectic day of travel, my treatment of choice was the Eminence Seasonal Pedicure. Like everything else at L’Auberge, this was no ordinary experience. It began with a warm therapeutic foot soak infused with passion fruit extracts. The essence and aromas change with the seasons. My esthetician then performed an exfoliating scrub on my lower legs and feet, followed by a 20-minute massage using the same seasonal scented oils. By the time she started to work on my cuticles and nails, my aches were gone. The pedicure ended with the application of a fresh coat of polish in my choice of colors. My feet felt great and looked even better. I was more than ready to hit the dance floor!